As iPhone 5S owners get acquainted with Touch ID and iPhone 5C-sters show off their hued handsets, iPad hopefuls are awaiting the release of Apple's next slates. 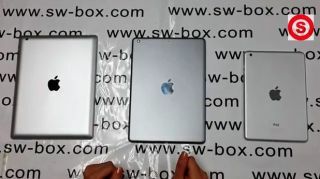 Leaks of the iPad 5 and iPad mini 2 are popping up left and right, and now thanks to a recently discovered vid from sw-box.com, we potentially have a side-by-side-by-side comparison of back casings belonging to the iPad 5, iPad 4 and first iPad mini. The video primarily sizes up the iPad 5, in new space gray, with the iPad 4, pitting the dimensions of each tab against the other. The measurements nearly match earlier comparison leaks we've seen, piling on credence to rumors we're in for a smaller, thinner and lighter iPad. Now, one red flag that the video might be a hoax is that the iPad 4 casing is without any markings ("iPad," an FCC engraving, etc.). The iPad mini is also sans a few key scribblings, however both may simply be unfinished casings. The iPad 5 back plate in this video not only hits the dimensions of earlier leaks, but various structural elements, such as iPad mini-inspired speakers, double volume buttons and the curvature of the tablet strike chords we've seen before. We're anticipating an Apple iPad event to go down in October, possibly Oct. 15, at which point we hope all the answers to our burning iPad 5 questions arrive in a nicely tied bow. Does Samsung have a little gold-phone envy?